One more reason that good Karma is building for MU's game tonight -- the Dalai Lama. While in New Delhi earlier this week, I snapped this photo. 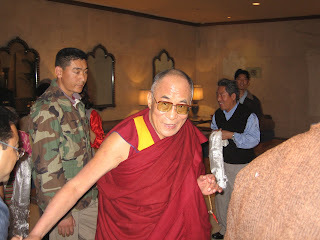 There is the Dalai Lama as he walked through the hotel lobby --- glancing my way as he hurried to his motorcade. Judging by the pleasant smile on his face here, could it be that the spiritual teacher was reinforcing goodwill towards MU? Priceless. By the way: big hitter, the Lama.